Superbugs, also called Multi Drug Resistant (MDR) bacteria are resistant to several antibiotics. Not all superbugs necessary cause a severe infection, though. A common superbug is MRSA. Methicillin Resistant Staphylococcus aureus (MRSA) is a strain (a genetic variant within the same species) of a Staphylococcus aureus bacterium, resistant to antibiotic methicillin and other antibiotics from the same class as penicillin, amoxacillin and oxacillin. The main problem with MRSA is that it is often not recognized as such, and is therefore treated with inappropriate antibiotics (1, page 25). It is impossible to say from staph skin infection pictures, if the cause of infection is MRSA (Methicilin Resistant Staphylococcus Aureus) or an “usual” staph – MSSA (Methicillin Sensitive Staphylococcus Aureus). Even a staph carrier without any symptoms can have MRSA. Folliculitis, which is usually a mild infection, may also be caused by MRSA or MSSA (folliculitis pictures). Pictures obtained by a light or electron microscope cannot help in distinguishing between MRSA and usual staph. 1. Antibiotic susceptibility test: an inhibitory zone (no bacteria growth) is seen around the methicillin (today oxacillin is used) disc put onto a staph colony, if a strain of staphylococci bacteria is methicillin sensitive. If bacteria are methicillin resistant, no inhibitory zone around the disc is seen. CO-MRSA = Community Onset MRSA, and HO-MRSA is Hospital Onset MRSA, terms describe the source of infection when found in a healtcare unit. ‘MRSA virus’ is a commonly used term that is obviously incorrect, since MRSA is a bacterium. In 1940, penicillin was introduced, and in 1942 first cases of penicillin resistant staphylococci were reported. In 1961 methicillin, effective against penicillin resistant staphhylococci was introduced, but in 1963 Methicillin Resistant Staphylococcus Aureus (MRSA) was recognized. MRSA first appeared in hospitals among old and severely ill patients; this type is now called Health-care Associated MRSA or HA-MRSA. MRSA has later spread out from hospitals, and this type is called Community-Associated MRSA or CA-MRSA. CA-MRSA was first reported in a high school wrestling team in 1993 (8). Health-care associated staph infections include surgical wound infections, urinary tract infections, bloodstream infections and pneumonia (4). 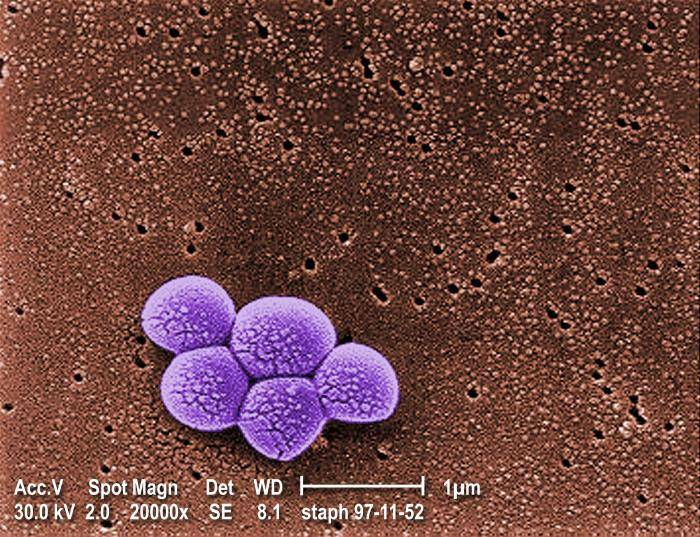 It is not possible to differ between MRSA and common S. aureus infection solely on the basis of staph infection symptoms. In Ha-MRSA, the presence of Staphylococcal Cassette Chromosome types I, II or III result in resistance to multiple antibiotics, including most ß-lactams (6). HA- MRSA is usually spread from a patient to patient by health workers’ hands and medical instruments, like stethoscopes or oxygen masks. Individuals colonised with MRSA may serve as a MRSA reservoir. Healthcare workers should wash their hands after contact with each patient. Patients colonized with MRSA may be treated with antibiotic mupirocin applied onto their skin or nasal mucosa. There are no permanent indwelling catheters or medical devices that pass though the skin. From above criteria, it is seen that CA-MRSA is not a microbiological term, but an epidemiologic term. CA-MRSA in some cases can be more virulent (potent to cause disease) than HA-MRSA (9). CA-MRSA is usually resistant only to beta lactam antibiotics. The basis of CA-MRSA antibiotic resistance is a mecA gene, a part of mobile Staphylococcal Cassette Chromosome – SCC mec type IV. MecA gene encodes for a variant of Penicilin Binding Protein (PBP 2a) that reduces capability of penicillin to bind to bacterial wall, thus preventing its destruction (6). Genes erm or msrA, responsible for resistance to erythromycin and clindamycin, can also be present in CA-MRSA. One of mechanisms of resistance is pumping of antibiotic out from the bacterium (6). Beta-lactam antibiotics are broad class antibiotics including penicillins (penicillin, methicillin, oxacillin, amoxicillin…), cephalosporins, monobactams (aztreonam), carbapenems (likeimipenem), and beta-lactamase inhibitors (like clavulanic acid). They inhibit the synthesis of the bacterial cell walls (7). CA-MRSA often produces several toxins, including Panton-Valentine leucocidin (PVL), which causes tissue necrosis (6). Injured skin. Minor injuries from shaving, depilation or tight clothes, or wounds and burns may be quickly followed by MRSA skin infection. Skin diseases. Persons with dermatitis, psoriasis, eczema are at higher risk to get staph infections. Frequent skin-to-skin contact. Most reports of CA-MRSA so far were from football, wrestling, rugby, and fencing clubs (9). Sharing towels or athletic equipment enables spread of MRSA. Crowded or unsanitary conditions in schools, dormitories, military barracks, households, correctional facilities, daycare centers, prisons (9). Young age. In children and young adults, CA-MRSA entering through the skin can quickly cause a dangerous form of pneumonia. Children may be susceptible because their immune systems are not fully developed. Weakened immune system (HIV, cancer). Contact with health care workers represent an increased risk of serious staph infections. Veterinarians who have contact with farm animals, especially pigs (9). The common route of transmission of CA-MRSA is through slight skin injuries (for example, due to shaving or clothes friction) or from contact with a CA-MRSA carrier. Other ways include poor hand washing, poor personal hygiene, sharing razors, towels, clothes and sport equipment (9). 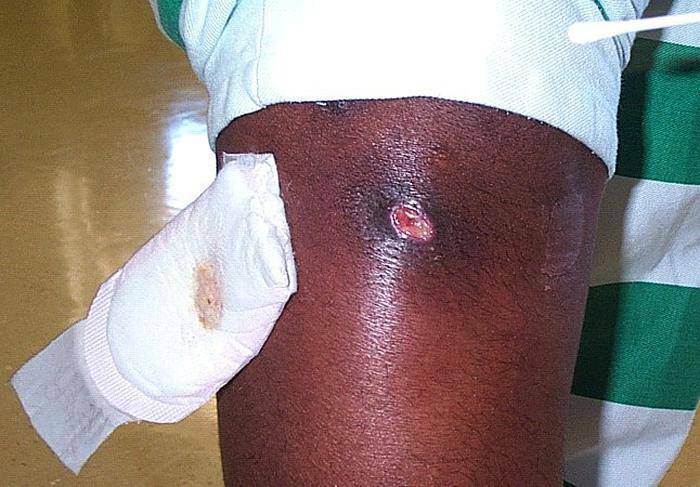 In the community, most MRSA infections typically appear in an otherwise healthy person as pus filled skin rashes, often described as an “infected pimple” or “insect bite”, which are actually folliculitis or boils (3,4). Rarely, serious life threatening infections, such as pneumonia or sepsis, may appear, usually in children (3,6). MRSA infections may range from mild to fatal. Severity of infection depends on infected organs (blood sepsis, MRSA pneumonia or meningitis are all dangerous), patient age (newborns and old people often get seriously infected), bacterial virulence, time of onset of antibiotic treatment and proper choice of antibiotics. Almost all mild MRSA skin or soft tissue infections can be effectively treated by warm soaks and drainage of pus with or without antibiotics (6). Antibiotics appropriate for mild to moderate CA-MRSA infections include clindamycin, trimethoprim-sulfamethoxazole (TMP-SMX) or tetracycline class antibiotics doxycycline and minocycline (the later two should not be used in children under 9 years of age). Combination of rifampin and TMP-SMX may provide increased efficacy. 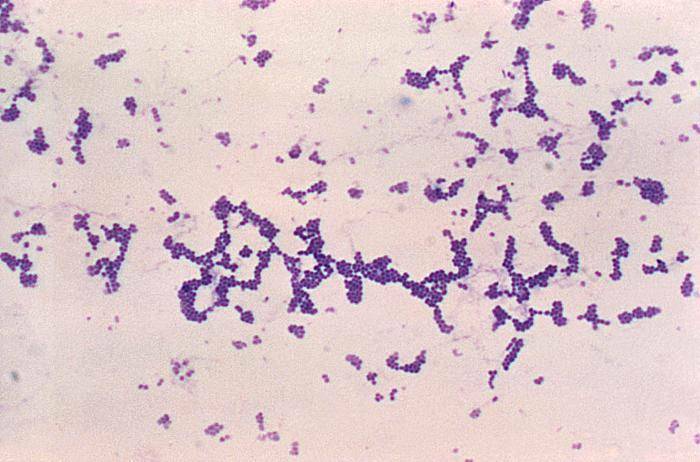 Rifampin should not be used alone, as resistance to this antibiotic develops rapidly. Rifampin may cause staining of body fluids or contact lenses, and excessive sweating. In severe MRSA infection intravenous vancomycin is a drug of choice (9). Linezolid is costly, and resistance to it was already reported. Susceptibility testing should be performed on all isolates. Clindamycin should not be used if D-testing is positive. Daptomycin is costly and available in parenteral form only. Quinupristin-dalfopristin is also costly, available only as a parenteral dosage form, and may have unpleasant side effects like pain upon an injection, thrombophlebitis, or muscle pains (6). CA-MRSA carriers have MRSA on the skin or in nasal passages without having any symptoms. While 20-30% of people can be colonized by S. aureus, only about 1-3% have MRSA (9). MRSA colonization of the skin may be treated with disinfectants, like chlorhexidine. An intranasal colonisation can be effectively treated with intranasal antibiotic mupirocin, but a re-colonisation is common (2). When MRSA infections recur frequently, a resistance to previously used antibiotic has to be considered, antibiotic susceptibility test made, and new antibiotic used accordingly. A MRSA nasal colonization has to be checked, and if positive, treated with mupirocin. CA-MRSA is mostly transmitted by hands, so hand washing after a hand shaking and touching door knobs, computer keyboards and other likely contaminated surfaces should be a regular practice. Using protective barriers on toilet seats and wearing shower shoes in public showers is strongly recommended. All oozing skin infections should be disinfected and covered with a clean bandage. Athletes should take a shower right after the training hours. Sport clothes should be washed after each use. Athletes should avoid sharing clothes, towels, razors and other items. Sport equipment and all possibly contaminated surfaces should be regularly cleaned and disinfected. An athlete with a skin infection should see his health-care provider. All infected skin lesions have to be covered with a proper clean covering and checked daily by a doctor for eventual worsening of signs. There is no need to test all athletes in the club if one or more athletes have a MRSA infection (3). Athletes with mild infections may return to training once an appropriate antibiotic treatment has commenced. There is no need to close the school, when few students get a MRSA infection. It is a school leader and local health authorities who decide what measures have to be undertaken in an MRSA outbreak.